The Port Charlotte Yacht Club hosted the 2015 2.4mr US Nationals to end the year of 2015. After a day of rest and repair from the US 2.4mr Midwinters, the US 2.4mr National Regatta was ready to begin. Winds again from the east-northeast set in as competitors headed out to starting area but by the time the racing was ready to start it had shifted slightly more east to almost 85 degrees. Nice course set by committee and racing was on its way. Wind was in the more moderate level with competitors having to monitor shifting winds back and forth. Nice regatta with 4 Canadian and 7 US boats competing. A few had to drop out on the last day, but overall the fleet continued the tight racing from the previous Midwinters Regatta. 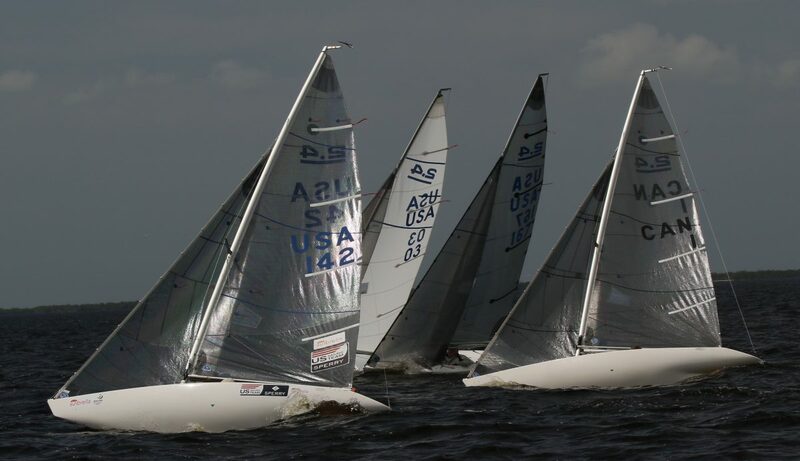 This regatta saw Charles Rosenfield, USA 142, find his groove and take first place with 7 points accumulated in the regatta. Second was taken by Tony Pocklington, USA 3. This was almost a complete reversal of points between these two from the previous regatta. Third in the regatta was Peter Wood with 18 points. Third US boat, and fourth overall was Kevin Holmberg, USA 160 with 26 pts. Click here 2015 US Nationals results for the results of the regatta. Thanks to the Charlotte Harbor Yacht club and all of the support staff that helped make this another fantastic 2.4mr event.